False Hypothesis: Keeping a star tied to the franchise for too long is an outdated concept that we must evolve from. -Magic Johnson’s advice to Kobe. More comments here. Let’s set aside the fact that it’s an absolute travesty that the person who I believe is one of the greatest Los Angeles based HUMANS (Laker or Athlete simply isn’t good enough) of all time has become nothing more than a caricature in the past few years. Something I’ve pondered for years as a sports fan observing other teams is the concept of “nostalgia”. The reason I’ve observed this from afar is I’ve never had to tackle this before. I became a fan of the NBA around 1999, the same summer Phil Jackson joined the team [Don’t you dare throw the bandwagon label at me]. I became an NBA diehard during the insane 2004 off-season that saw the departures of both Phil and Shaq [see?]. The point is, for my entire NBA-fan life, I’ve had Kobe Bryant in my life. Until the 2012 Achilles injury, I never even experienced a Laker team without Kobe in the starting lineup. I lived through the Shaq feud, Eagle Colorado, the trade demand, driving Dwight Howard away, stubbornly shooting away wins, and none of it mattered. Why? Because Kobe is all I’ve ever know, and I’m so fortunate and thankful for it. Here’s my my question: Why is Kobe Bryant on this team this year? Like, I get it, but I don’t get it. I have always said that I wanted Kobe to retire a Laker, but now that the moment is near, what good did it do us? Just because it’s a feel-good story? How good is it feeling right now? Are the Lakers rebuilding? Or is the franchise looking at one more year of “championship or bust” Kobe and looking at packaging a (Basketball God-willing) top 5 pick and contracts to acquire a veteran, sign another veteran, and make another run at it? That would be a terrible decision, but if they’re not, again, why is Kobe Bryant on this roster? Conversely, in the Dark Side aka Boston, the Celtics shipped out Paul Pierce, one of the other “will play their entire careers in our jersey” candidates, when it became [somewhat] clear that it was time to rebuild. Paul Pierce still had much to give to the NBA as fans in Brooklyn and now Washington can attest to. That’s great! The Boston Celtics began their rebuilding and Paul Pierce was able to continue to play meaningful minutes for the remainder of his career while transitioning his style of play to better suit his age. Will any Celtics fan look at Paul Pierce leaving the team as a “disaster”? Maybe in the short term as the news was announced, but ultimately when we look at Paul Pierce we will remember him as one of the greatest Celtics players of all time. If Paul Pierce was on this Celtics team they would be a 6-10 seed for the next 3 years with Doc Rivers staying. Would you say that’s worth it to the organization as a whole? Or would you rather have 384 draft picks (approx.) over the course of the next 3 years with a young head coach and a franchise that is completely in “rebuild” mode? I say the latter, and I say it’s not even close. The counterpoint might be how weird it was for Hakeem to be with the Raptors or Patrick Ewing be with the Magic. 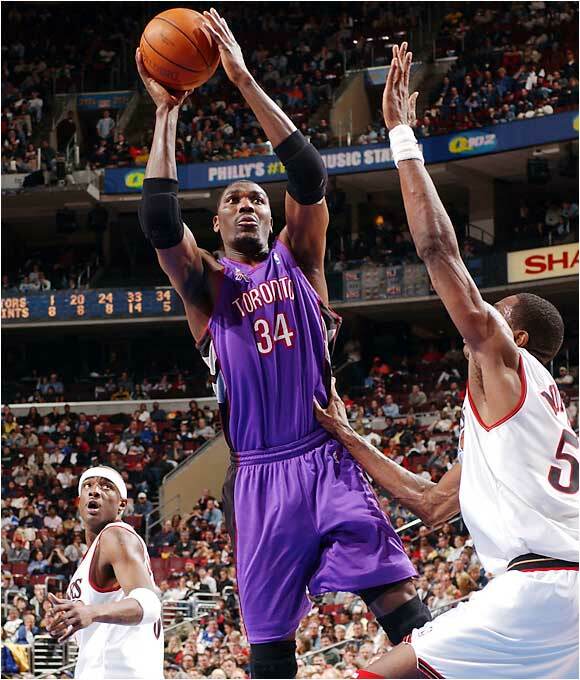 Sure it looks awkward, but do we think of Hakeem as anything but a great Houston Rocket? Ewing a great Knick? When does it ever end well for a true superstar anyway? During the off-season, shortly after the Lakers struck out in free agency, I pondered a Kobe-to-the-Knicks hypothetical. Here was my fairy tale: Kobe goes to the Lakers front office, thanks them for trying to build a contender through free agency and tells them that he understands it’s time to rebuild. He then says he would like to be reunited with Phil Jackson and Derek Fisher with the Knicks, and Carmelo Anthony is the only superstar he actually gets along with. Kobe plays the remainder of his career with the Knicks in MSG, doesn’t have to kill himself every night, and finishes his career with grace, albeit in a different uniform. Kobe for Amare works straight up. The Lakers don’t focus on any stopgaps, rebuild the team through the draft, offer restricted free agents like Kyle Lowry contracts rather than wait for Carmelo Anthony, and sell Kevin Durant (and others) the vision of building their own team in LA. Would the Lakers be better off? Yes. Would Kobe be better off? Yes. Was keeping Kobe in a Laker uniform this year the right call? No. Am I glad he’s still a Laker? HELL YES, but I’m talking Spock-Logic here. Short term— the Lakers would lose a lot of money, Time Warner wouldn’t be happy with the lack of ratings, Lakers fans would be devastated, some would even jump to the Clippers. Are we sure this isn’t happening in 2 years anyway? 100% positive? Why not control your destiny like Danny Ainge did in Boston? My long-winded bottom line: This idea of keeping your star players past their prime for nostalgia — which is what this is — is outdated. We can talk about Kobe’s extension forever, I believe it was the right decision, but the chips have fallen in the worst case scenario, so it was time to move on. Similar to the NFL, the NBA is headed in a direction where we won’t think of a team as the “Kobe Lakers” or the “Lebron Cavaliers”, it’ll be the “Gregg Popovich Spurs” and the “Budenholzer Hawks”, and that’s fine. It’s time for teams and fans alike who are holding on to old values to adapt to the new NBA.